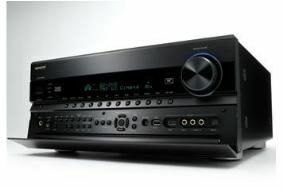 IFA 2010: Onkyo to reveal updated flagship THX home cinema system | What Hi-Fi? It's an upgrade to the THX Blu-ray system we first reported on in January. New for this autumn are the PR-SC5508 THX-certified AV network controller, and the BDP-SP808 Blu-ray player, which join the existing PA-MC5500 9.2 channel power amplifier. Available from October, the complete package will cost £4600. Individual prices are £2200 for the PR-SC5508, £1800 for the PA-MC5500 and £500 for the BD-SP808.The optional UP-DT1 DAB+ tuner module costs £130. The PR-SC5508 is a THX Ultra 2 Plus-certified, network-capable, 9.2-channel audio/video controller that acts as the brains of the system. It has a 3D-ready HDMI 1.4a interface, HQV Reon-VX video processing and ISF video calibration. It also offers DLNA 1.5 and Windows 7-compatible connection to PC audio (including FLAC files) and access to internet radio services such as LastFM, Napster and VTuner. The matching PA-MC5500 nine-channel THX Ultra 2 Plus analogue power amp delivers 220W per channel at 6Ohms. Rounding it all off is the new THX-certified, DLNA 1.5 compatible BD-SP808 Blu-ray player. It has an ethernet port for handling BD-Live content, an SD card slot for playback of other digital media files and an HDMI Source Direct mode to output the video signal in its native format for external processing by the PR-SC5508. The complete system will be on display at IFA, along with Onkyo's brand-new high-end stereo preamp and power amp. We'll bring you more info on the latter as soon as we get it.